Ever since his first New York reviews when the Village Voice critic wrote that he had “a definite melodic gift and knows how to orchestrate with a light and graceful touch” Robert Baksa has enjoyed a growing reputation as a creative artist of exceptional lyric gifts. The craftsmanship of his tonally oriented music gained respect even during the years when such a conservative esthetic was out of fashion. Born in New York City in 1938 of Hungarian descent, he grew up in Tucson where he attended the University of Arizona earning a Bachelor of Arts in Composition. He began composing in his early teens and some of his first pieces were published and are still performed. Baksa has composed over 500 pieces including songs, choral pieces, piano and harpsichord works, music for orchestra and chamber ensembles, film scores and two short operas. His first opera, on Millay’s Aria da Capo was given at the Lake George Opera Festival. 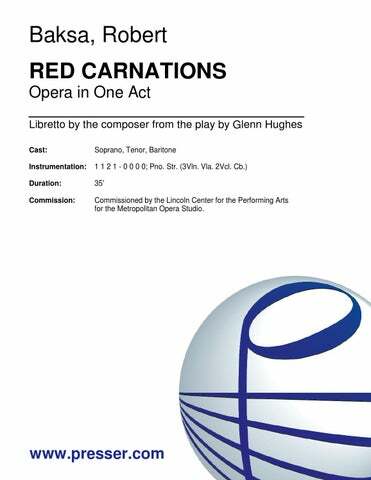 The second, Red Carnations, commissioned by Lincoln Center for the Performing Arts, has been widely used as an introduction to opera for audiences of all ages. His art songs are discussed in two recent studies of American art song and his choral pieces are performed the world over. Since the 1970s chamber music has been a major focus and Baksa has to his credit over 75 works for a variety of instrumental combinations. His works have been performed by such groups as the Boehm and Virtuosi Quintets and the Sylvan Winds, the New Jersey Chamber Music Society, Elaine Comparone and the Queens Chamber Band, Igor Kipnis, Burt Lucarelli, Sharon Robinson and the New York Virtuosi conducted by Kenneth Kleine. The world famous St. Luke’s Chamber Ensemble made its debut with an evening of Baksa’s music in 1974. His music has been featured at National Flute Association and Double Reed Society conventions, at the Caramorr and Newport Festivals and at the Library of Congress. His Quintets for Wind Instruments and String Quartet are widely performed as is his extensive repertory for the flute and the harpsichord, two instruments for which he has demonstrated a particular fondness. In the last decade of the 20th Century he completed his series of sonatas for all the standard melody instruments, 27 works to date. The series includes several for keyboard instruments including one for Accordion which was commissioned by the American Accordion Association. The composer makes his home in Columbia County, New York. (Chamber Concerto No. 2) 19′ Fl. Ob. Cl. Bsn. 2Vln. Vla. Vcl. Cb. (Etudes and Chorale) Fl. Ob. Cl. Bsn. Tpt. Hn. Tbn. Version Transcribed for Chamber Orchestra by Robert Baksa(arr.) 7:40 1 0 1 0 – 0 1 0 0; Harm. (or Synthesizer with Reed Org.) Pno. Str. Theme and 8 Variations 16′ 1 1 1 1 – 1 0 0 0; Str. for Clarinet Quartet and Band 4Cl. soli; 3(dbl. Picc.) 2 2 2 2AltoSax. 1Ten.Sax. 1Bar.Sax – 4 3 3 1 2Euph. ; 4Perc. Cb.